Nær baskiske Corniche, er smuk villa på 215m2 beliggende opstrøms af en bakke. Moderne stil, er det placeret i en usædvanlig indstilling. På grund af sin førsteklasses beliggenhed, det har betagende udsigt over havet og bjergene. Den består af 6 værelser, en tilsyneladende uendelig pool spredt i dalen og har en solrig klima. Hele villaen er foret med eksotiske natursten og træ terrasser og forskellige afslapning og hygge. Frame '' Dejlig, afslappende, perfekt. '', Hvilket er for alle dem, der drømmer om at forene i en meget turistede del, hjemkomst og moderne komfort. Bestilling er normalt i mindst 7 dage, fra lørdag til lørdag, men tøv ikke med at kontakte mig for nogen anden periode. Fuldt udstyret til små børn (baby rejse seng, høj stol, puslebord, plast retter). Velkomstgave! A truely outstanding villa in all respects! We spent a week in this amazing villa with our 4 adult children plus two partners. We were all blown away by the stunning location of this house - the breath-taking views are even better in real life than on the picture if that is possible! We had never visited Basque country before and we all fell in love with the incredible mix of mountains and Atlantic coast. The house was extremely comfortable, really well equipped for the size of group, peaceful, spacious and beautifully clean. 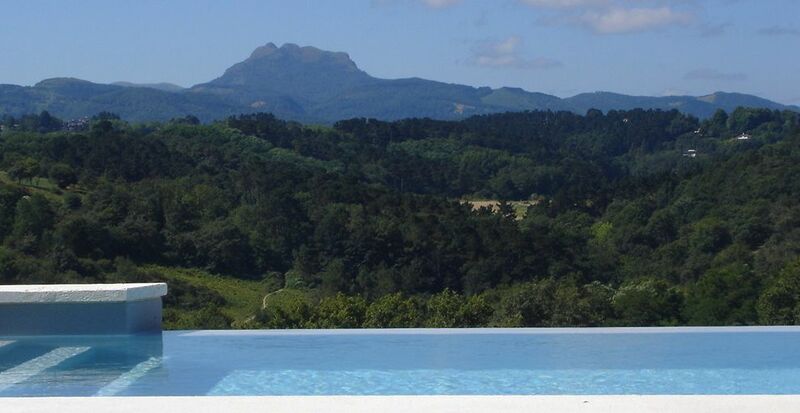 Sitting in the lovely pool with that stunning view was a fabulous way to end a day after surfing at Hendaye or visiting some of the local markets and towns. We loved the walk down to the sea on the Corniche road (about 30 mins) and saw lots of new wildlife on the way. Definitely recommend a trip up Massif de la Rhune on the funicular for more incredible views. Mr and Mrs Cigarroa who look after the house couldn't have been more helpful or charming. Sonia, the owner, was always really quick to respond to any questions we had. All in all a superb place to spend your holiday! Atlantikküste oder Pyrenäen, Biarritz oder San Sebastian, Pool oder Kamin - wir hatten in dieser tollen Woche die Qual der Wahl. Auf jeden Fall war die Wahl des Hauses aber die richtige und wir haben uns an diesem schönen Fleckchen des Baskenlandes sehr wohl gefühlt. Unkomplizierte Abwicklung durch die Gastgeberin und das sich kümmernde Nachbarehepaar. Ce fut un plaisir de recevoir ces vacanciers. Ils ont pris grand soin de la maison et ils ont été d'une grande gentillesse. Nous espérons qu'ils reviendront nous voir prochainement! Very cosy, impressing holiday home. Love on first sight with the pool, the beautiful decorated rooms, the unbelievable view. Near to the ocean to the surfers paradise of Hendaye as well as to La Rhune the firs real mountain top of the Pyrenees atlantiques. Clean and cosy. The kitchen almost like home. Ice cubes, a gas barbecue and lots of space to enjoy the stay. We really enjoyed our stay at this villa. The house is very well provided for both in space and facilities. everything we needed was here and the neighbours who act as caretakers were very helpful in explaining things on arrival and for a couple of small questions later. the house itself is large, airy, modern and a pleasure to stay in. Location is great for families - 5 minutes to a beautifully sanded beach with breakwaters for the Atlantic waves in Socoa ; 5 minutes to the WowPark and highropes courses with each having something for kids from 3 onwards; 15 minutes to Le Rhune for a great day out climbing the local Mont. 5 minutes to village shops or supermarket as you need. you'll need a car (or good legs on a bike) but this is a really good property in a wonderful location - there's too much for a week in the area and plenty for two we now think. Great de lux villa for a super vacation! It is a wonderful villa with marvelous views, great localisation as it is near many intersting attractions of the region. We really enjoyed our vacations there, the pool and terrace area makes you relax and relax. The house is very well equiped. We mixed days at the pool, with golf, beach and tourist day trips. Sonia kept good communication before, during and after our stay.